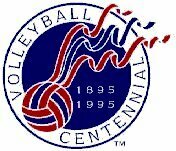 Did you know that in 1995 the sport of volleyball celebrated its 100th birthday? The history of volleyball began way back when the sport was invented in 1895 by William G. Morgan, an instructor with the YMCA in Holyoke, Massachusetts. William G. Morgan decided to blend elements of basketball, baseball, tennis, and handball to create a game for his classes of businessmen which would demand less physical contact than basketball. He created the game of Volleyball (at that time called mintonette). Morgan borrowed the net from tennis, and raised it 6 feet 6 inches above the floor, just above the average man's head. The history of volleyball reveals that on July 7th 1896, at Springfield College the first game of "volleyball" was played. There is a good book, "Volleyball Centennial : The First 100 Years", available on the history of volleyball. 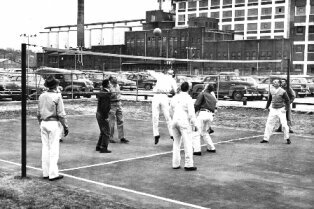 The first volleyball net, borrowed from tennis, was only 6’6″ high (though you need to remember that the average American was shorter in the 19th century). Two years later, the first 2-man beach volleyball game was played, though the professional side of the sport did not emerge until much later. Not surprisingly, the first beach volleyball association appeared in California (1965), and the professional players united under the auspices of the AVP (American Volleyball Professionals) in 1983. During the 1984 Los Angeles Olympics, American men and women took gold and silver medals in indoor volleyball competition. Four years later at the Olympics in Korea, the men once again scored gold. Starting in 1996, 2-man beach volleyball was officially introduced to the Olympics. Today, there are more than 800 million volleyball players worldwide, 46 million of them in the U.S. In 1922, the first YMCA national championships were held in Brooklyn, NY. 27 teams from 11 states were represented. In 1928, it became clear that tournaments and rules were needed, the United States Volleyball Association (USVBA, now USA Volleyball) was formed. The first U.S. Open was staged, as the field was open to non-YMCA squads. In 1937, at the AAU convention in Boston, action was taken to recognize the U.S. Volleyball Association as the official national governing body in the U.S. In 1947, the Federation Internationale De Volley-Ball (FIVB) was founded. In 1949, the initial World Championships were held in Prague, Czechoslovakia. In 1964, Volleyball was introduced to the Olympic Games in Tokyo. In 1975, the US National Women’s team began a year-round training regime in Pasadena, Texas (moved to Colorado Springs in 1979, Coto de Caza and Fountain Valley, CA in 1980, and San Diego, CA in 1985). In 1977, the US National Men’s team began a year-round training regime in Dayton, Ohio (moved to San Diego, CA in 1981). In 1983, the Association of Volleyball Professionals (AVP) was formed. In 1984, the US won their first medals at the Olympics in Los Angeles. The Men won the Gold, and the Women the Silver. In 1986, the Women’s Professional Volleyball Association (WPVA) was formed. In 1988, the US Men repeated the Gold in the Olympics in Korea. In 1996, 2-person beach volleyball will be an Olympic Sport.